Rave Reviews at the Boulder Fringe! Fresno Bee votes Flying Dreams one of the Rogue Festival's hits-not-to-miss! Flying Dreams wins 'Outstanding Theater Piece' Award! Audiences in San Francisco were treated to the premier of Flying Dreams in an intimate setting at The Garage. First thought that came to mind? Honestly? Aaron Jessup's show tonight was, within the past 11 years, one of the very few I've witnessed on this coast...head to toe, top to bottom, laugh until you realize you're crying. A single case of props & a head full of stories. This show blew my mind and broke my heart. I loved it. BRAVEE Mr. Aaron Jessup!! Funny, talented skills, and personal stories ALL there in one show. GO see this. I had laughing tears thru most of it. And I'm so glad I went. Great show! So much intensity in all emotional directions within such a short time. Thanks for sharing your intimacy, skill and performance in such a powerful and meaningful way. 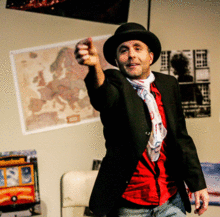 An epic "bromance," a time-traveling European adventure, Flying Dreams is a one-man, multi-character laugh riot that goes from hilarious to heartbreaking and back again. Encouraged by a brash friend, a young, painfully shy American juggler finds himself penniless and alone on the streets of Europe. Weaving the worlds of theater, circus, vaudeville and busking, Flying Dreams features smart comedy, deft character work and expert juggling. Aaron Jessup has won top honors at international busking competitions and street performed throughout the U.S., Europe and Australia. 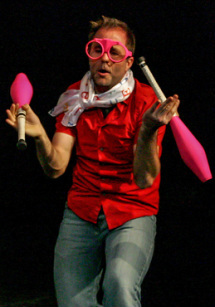 He has appeared locally with Pickle Family Circus, Make*A*Circus, and the Izzy-Award winning Scott Wells and Dancers. 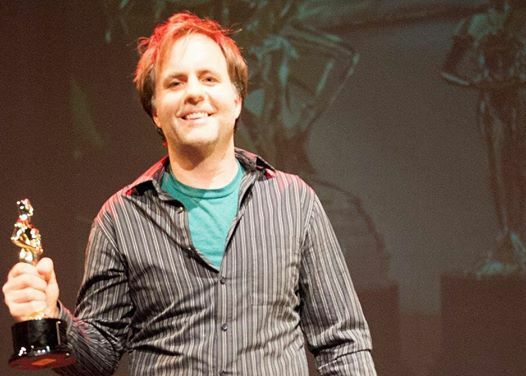 Performing everywhere from cruise ships to comedy clubs, stages to street corners, Aaron is excited to bring his first one-man theater show to the Santa Cruz Fringe Festival. Aaron would like to express a debt of gratitude to his father for starting him down the winding road of art-making, as well as his talented instructors and advisors at UC Davis, where he recently received his MFA in Dramatic Art. In particular he would like to thank Larry Bogad, MaryBeth Cavenaugh, Bella Merlin and his inspiring MFA colleagues. Significant creative contributions were also made by David Ford at The Marsh Theater in Berkeley. Flying Dreams is dedicated to an old friend fondly remembered; a generous spirit, a towering talent and taken from this world way too soon.